The Villa les Mots Passants, an old bourgeois house from the beginning of the 20th century welcomes you withsimplicity and authenticity, in the heart of Cabourg. Our atypical half-timbered Villa, far from the standardization of hotel chains, invites you to discover its "retro-romantic" style rooms all decorated in pastel shades on the theme of great Norman writers. Come and enjoy a moment of relaxation in one of our 14 rooms. The Villa features Small Standard Rooms (with shower) as well as Superior Rooms (with bathtub), which are more spacious and which we recommend for longer stays, for guests with more luggage or simply wanting more confort and space and larger bathrooms. If you need any further information, please feel free to contact us by e-mail. We will be pleased to advise you on the type of room that would most suit your needs. 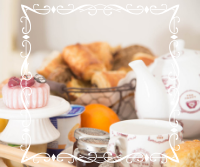 At the Villa, we hope you will feel at home and wil enjoy the atmosphere of our small, family-run , « Bed and Breakfast »- like hotel. Where to find the Villa? The Villa is ideally located at the gates of the Pays d'Auge and the D-Day beaches. It is nestled between two pretty gardens of the city center by which a short walk takes you to the beach by the Avenue de la Mer, the shopping artery of the city. Our breakfast is buffet style and is served the main room. It can also be served in your own room or in the garden in fine weather. It consists of different kinds of bread, pastries, cold cuts, eggs, cheeses, homemade jam, home made cakes.. The buffet is served from 8:30 to 11:00 am every day of the week. Only our superior comfort rooms, more spacious and with bathroom are adapted to infants.If you want to bring your own baby cot please book this room category. La Villa les Mots Passants does not have private parking. However, you can easily park in the free car park of the church which is located right in front of the hotel There is also another public parking located behind the hotel close to the visitor center. The rooms of our hotel are spread over 3 levels. The Villa does not have a lift but we have several rooms on the ground floor. Do not hesitate to ask us if necessary. Our hotel does not have rooms for disabled guests.